If the springs of your garage door ever breaks it can be extremely dangerous. Because most spring failures happen during the door’s operation, the door (or the counterweight) could potentially cause damage to whatever’s beneath or around it, and the sudden release of tension can be dangerous in its own right. We strongly advise homeowners to watch out for any warning signs that their garage door springs might be in need of replacement. These can include wobbling or squeaking during the door’s opening and closing cycles, or an obviously tilting panels - if your door can’t fully support its own weight, the springs will likely be in need of attention. It’s always best to prevent further problems from developing rather than waiting for them to occur, and our service technicians can perform routine examinations of your door that will catch these types of problems well in advance. Many homeowners are tempted to go the DIY-route when facing various problems in their home. 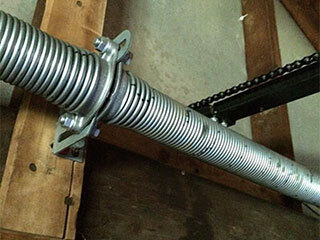 When it comes to garage door springs, however, that's a bad idea. If the tension in these units is not safely released it can be dangerous to anyone in the vicinity. We strongly advise homeowners to contact us rather than try to attend to these components by themselves. Garage door springs are built to last, which means by the time they’re in need of replacement they’re usually quite outdated. Our stock of modern varieties are fully treated with the latest anti-corrosion coating material, and are typically much stronger and more durable than the springs they’re replacing. Upgrading these components is a sensible investment for the future, and should keep your door working perfectly for years to come. If your garage door springs are beginning to fail, you need a team of professionals to solve your problems. Contact our experts at Garage Door Repair Las Vegas to find out how we can help.